ANN ARBOR, Mich. (AP) Minjee Lee’s task was simple: A birdie on No. 18 would win her the tournament. It was a manageable par 5, the easiest hole on the course in the final round. After a good drive, her second shot came closer to trouble than much of the gallery probably realized. Lee’s shot came to rest just to the right of the green, and from there it was a simple chip and putt for the birdie that gave her a one-stroke win over In-Kyung Kim at the LPGA Volvik Championship on Sunday. Lee, who turned 22 on Sunday, won for the first time since 2016. It was the Australian’s fourth career victory. Lee three-putted for a bogey on No. 17, dropping into a tie with Kim, who finished her round about the same time. So Lee needed a birdie to win on 18. The 18th hole was 470 yards Sunday. There were 44 birdies there in the final round. Lee made her winning putt from about 3 feet. She finished at 4-under 68 and 16 under for the tournament. Kim (67) shot a 32 on the back nine and birdied No. 18, but it wasn’t enough to force a playoff at Travis Pointe Country Club. Moriya Jutanugarn (65) finished third at 14 under. Lee took a two-stroke lead into the final round, and that was her margin over playing partner Stacy Lewis before Lewis (71) bogeyed No. 7 and 8. 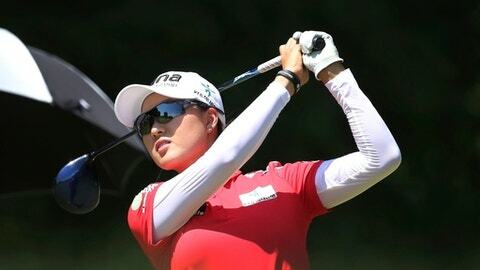 Kim emerged as the biggest threat to Lee when she birdied four of the first five holes on the back nine. Lewis is playing four months’ pregnant with her first child. Kim and Lee were briefly tied at 15 under, but then Lee made a tap-in birdie on the par-5 14th, while Kim bogeyed 15. Lee saved par on 15 despite a wayward drive into a bunker. Lee had gone 38 consecutive holes without a bogey before making one on the par-4 17th. That, combined with Kim’s birdie on 18, left the two golfers tied, but Lee still had the 18th to come. Su Oh (68) and Lindy Duncan (69) finished at 13 under, and Megan Khang (67) was another stroke back. Lewis finished at 11 under along with Ariya Jutanugarn (69) and Danielle Kang (70). Lewis birdied three of the first six holes, but Lee did as well. Lee lost this event by one stroke last year. Shanshan Feng, the 2017 winner , finished tied for 21st this time. The LPGA has had a different winner in each of its 13 tournaments this year. The U.S. Women’s Open starts Thursday at Shoal Creek.